As Benjamin Zephaniah wrote: ‘A few years ago if u said yu were Green / Yu were really seen as Red’ [Me green poem, in City Psalms, Bloodaxe Books, 1992]. It’s noticeable how many of the poets have adopted a rather oblique approach, almost seeming to shy away from direct statements about the predicament we face. Is that a lack of confidence in the facts? A loss of nerve? I don’t think so. It is more a refusal to jump on the bandwagon of self-satisfaction like those corporations preening themselves on account of their ever so slight ‘green’ credentials. There are no token gestures among these poems. The poets are more honest than that; they do not claim to have solutions or even some special understanding. 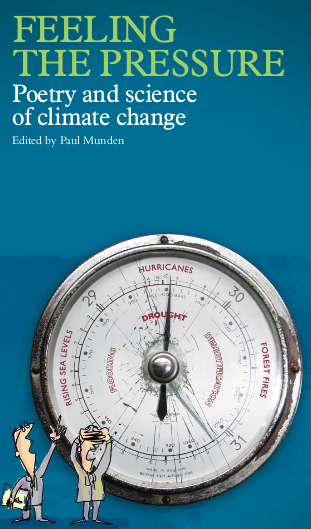 What is striking throughout all the contributions, however, is the way in which the science of climate change has clearly entered the language and permeated the way we think [Paul Munden]. The contributions are really good, with the poems grouped in 5 sections, each introduced by short prose contributions by scientists. My own favourite poem is the editor’s “Mitigation”. Now hopefully the British Council will assist a similar publication from scientists and poets in the those countries that have already suffered from, or will be most likely to be disproportionately affected by, climate change. Previous Previous post: Just how much did you pay for that forest?